Caramelised Onion – top with grilled cheese for added yumminess! Feed the pork through a mincer and then mix together with the remaining ingredients (except the casings) until well combined. Divide the sausage mixture into three and then mix in the other ingredients for each of the flavoured sausages. Once you have mixed up your three different mixtures put them each in turn back through the mincer, so you know they’re well combined. Now, take a couple of metres at a time of the casings and give them a good wash. Scrunch them onto the end of your sausage stuffer and begin to feed the sausage mixes through – make sure you leave a good few inches on the end. Place a dish underneath the sausages so you have something to catch them. Leave another good few inches on the other end and then move along the long sausage twisting off the individual sausages to the length you would prefer. Repeat the process until you are all our of sausage mixture. You now have yourself loads and loads of sausages for you to freeze and cook as you please. We turned our initial batches into hot dogs but they also make great breakfasts, casseroles, or even with some hearty mash and gravy! This looks so delicious! I will have to try this. Also thank you so much for stopping by my blog. Thank you! 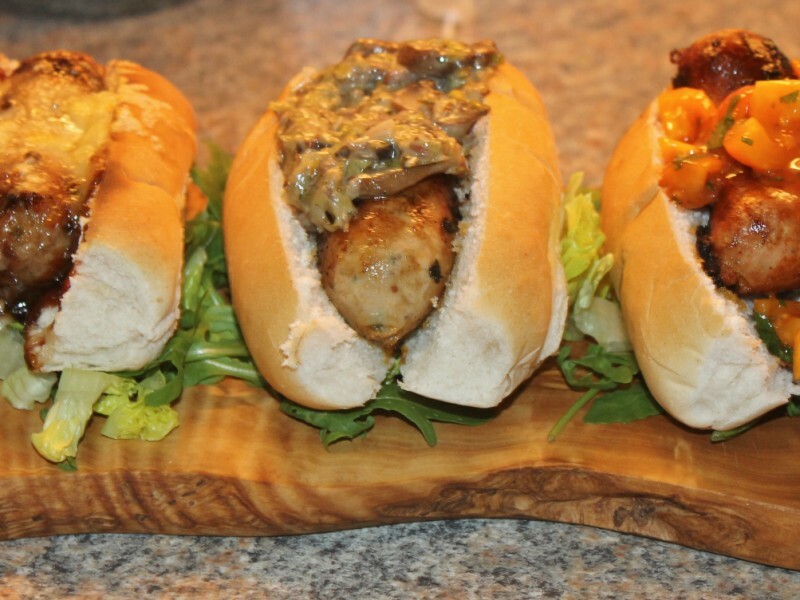 Homemade sausages are amazing – and so much fun to make! These look fantastic! I bought my other half a sausage maker the Christmas before last and so far he’s just made pork and apple (which were delicious). I’m going to put this article under his nose!! !